There is nothing like a bit of Buddhist poetry to remind me that we Christians are not the only ones searching for wisdom and understanding. So what does it mean? 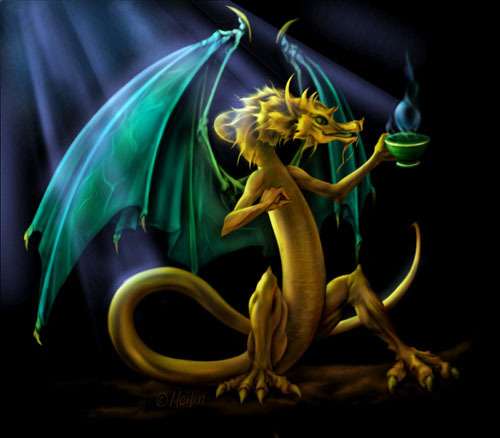 The dragon represents fear while the tea ceremony is a ceremony of great dignity and respect. It is not about surrendering to fear at all, but about understanding fear, respecting it, and being able to move about with dignity in the presence of that fear. So what does this have to do with being Christian? Allow me to present another quote, perhaps a bit more familiar. Perhaps because my faith is weaker than I would like to admit. Perhaps I forget to place myself in the presence of my Lord and Savior and to trust in His power. Power is defined as “the ability to act or produce an effect”. Fear is an emotion. It has no power in its own right. I give it power when I allow fear to control my actions. For example; fear did not keep me in two abusive relationships. I did that because I allowed myself to use fear as an excuse to not act, to not use my power to change my surroundings. It has taken me years to come to any understanding of my fears. God allows me to experience fear because there is so much I can learn from fear. I learn that I have to place my trust in Him. I learn that with His power and guidance, I can trust myself to navigate the stormy waters of life. I learn that fear can teach me to avoid situations that are dangerous or unhealthy. Without experiencing fear, how would I learn to trust? How would I know safety? How would I know security? So what am I so afraid of? Silly things scare me like bees, needles, tight spaces, and thunderstorms. But then there is cold hard fear. Fear of being abandoned, alone, unloved, unwanted and forgotten. Fear of not living life but surviving it. Fear of fear controlling me. Do you see the vicious cycles I set up for myself? I lock myself into the clutches of a monstrous dragon called FEAR. Now what? Now, I stop and try to understand. Why am I afraid? What power do I have? How can I use my ability to act to control fear instead of allowing fear to control me? As I journal, I can lock my fears to the page and now I have a respect for what my fears are trying to teach me. I can serve tea. Okay, so not always. I have some dragons that smash the china and devour the table. But then every day I can look to the Bible and remember not to be afraid because I am precious in His sight. I have the power of God within me and fear has nothing on that. This one verse alone sums up the purpose of this blog. The Lord blessed me with a gift that I allowed to stay hidden for years, sharing only with those closest to me and those I was certain would not reject me for it. I was blessed with a gift to write clearly and passionately about all that the Lord has done for me. But instead of openly proclaiming His wondrous love, I kept it to myself, afraid of what people would say about me. I was afraid to be labeled as a zealot, a preachy, obnoxious, in-your-face, holier-than-thou shrew. Or at least that’s the excuse I used to justify my lack of action. Honestly, I was ashamed to be so bold in my faith as to share with the world what God shared with me in private. I liked being quietly faithful, not bothering anyone, not stirring up trouble, not taking on the dreaded labels of “religious”, “churchy”, or “too Catholic”. Looking back on my attitude makes me sad and gives me hope at the same time. Sad because I denied who I was and what I was gifted to become. Hopeful, because I am breaking out of that denial and I am becoming the woman I was gifted to be. So what changed? The Lord blessed me with a miracle I would not dare to ask of Him. He restored my sight – physically and spiritually. In a single instance, He spoke to me in the darkness, at the deepest reaches of my soul, and granted me the courage to speak in the light and proclaim His whispers from the housetops. On December 7, 2007, a typical Friday morning, I was at work and noticed that I could not see properly out of my left eye. Denial set in instantly, along with cold hard fear. I had never had anything like this before but I tried to tell myself it was just a migraine coming on or the stress of the ongoing divorce proceedings getting to me. I was seeing gray streaks running across my field of vision and there was pain all around the eye. I waited through the weekend, hoping a migraine would set in and prove that it was nothing more serious than that. By Monday, it was much worse and I called my eye doctor. Seven doctors and one MRI later, it was Christmas. I had been told they didn’t think I had MS, but they wanted a second MRI to confirm that diagnosis. They also wanted a look at what they told me was a tumor on the optic nerve. By now the vision in my left eye was labeled on the visual field tests as a total loss. I could see out of it, but barely and the colors were all wrong. Red was black, white created a starburst effect, and yellows and oranges washed out to pastels. On Christmas Eve, when I glanced down at my five-year-old son, who was sitting on the kneeler by my left knee, I could not see his face. After Christmas, I had the second MRI and after a five day agonizing wait for results, was told that the suspected tumor was a severe inflammation of one of the torsional eye muscles. There was also an inflammation of the fat tissue behind the eye. The two were pushing the optic nerve out of place and also compressing it, thus causing the pain, vision loss, and color loss. The treatment was a massive dose of Prednisone, a wonder drug that has the power to turn me into a fast-talking, foul-tempered, short-fused, emotionally unstable witch. It also allowed me to go three to four days at a time without sleep. I finally caved after the second week and requested something to help me sleep. I was given Ambien. With Ambien, I could take a tiny pill and stay up for an hour or so making lunches, writing checks, signing permission slips, calling my estranged husband and the best part it all was that I did not remember any of it. My mother and sister teased me about the Ambien blackouts. They also took my car keys at night. The unfortunate part of this treatment was that I was on it from January 1st until February 29th. The fact that no one dropped a house on me during those two months is probably a miracle unto itself. But house-dropping aside, it worked. My vision improved drastically but did not return to normal. I had noticed some decline in my right eye, but was told it could be due to the Prednisone. The only way know if the drug was causing the problem in the right eye was to come off it slowly. I joked with the doctors that their game plan was to “come off the Prednisone and pray”. Not funny, that was actually the plan. Through all of this, I was surrounded by family, friends, and a faith community that enveloped me in prayers, hugs, and offers of assistance. I found myself unable to see clearly and yet I could see clearly the very face of Christ in those around me. Just before Christmas, I went to confession and found that I while I could not see the beautiful stained glass windows in the church, I could see the stains on my soul with a clarity I had never known. In that confessional, my pastor told me that losing my sight was my greatest blessing. He was so frighteningly and prophetically right. On February 29,2008, I stopped the medication. I was told two things: the nerve could be permanently damaged, never returning to normal and that this could recur, at which point they would start looking at more serious causes such as lymphoma, lupus, and a number of other diseases. I made plans to come back in April and crossed my fingers. My vision remained stable for about a month. Then it began declining slowly in both eyes. This time there was also a constant pain on the top of my head, about the size of a half-dollar. There was also pain whenever I moved my eyes. I told myself it was the flu, stress, being tired, maybe a migraine. Finally, I reached the point that I needed to know what I facing. I saw my primary doctor on a Tuesday, telling him I had an appointment with the neuro-opthalmologist on Friday. He told me not to wait that long. I saw the neuro-opthalmologist the next day and had an MRI, my fourth, on that Friday. The whole process was starting over. By the following week, I had lost enough peripheral vision that I nearly had tunnel vision. I also started seeing double. The left eye was going dark and the right eye was seeing black streaks like I had seen in the left one in December. They told me a biopsy was most likely the next course of action. Muscle inflammation doesn’t spread to the other eye or cause the pain on the top of my head. I was due to make my Cursillo weekend on May 17th and my sponsor told me repeatedly that I could wait until September. I insisted that I was supposed to go one this one. There was such a feeling of urgency in me that I could not explain but by then I was learning to trust the pull of the Holy Spirit. I assured everyone that I would be fine, somehow. “Mom, I go to just let God hold me and love me.” I could see she didn’t buy that so I just left it alone. I quietly called my estranged husband and asked him to drive me. I drove to his house and he drove to the church, which was in the next town over. As I sat in pew, I kept my eyes closed through nearly the entire Mass. The double vision was making me nauseous and dizzy. The pain on the top of my head was now excruciating, as though someone were forcing a railroad spike through my skull. As the Mass ended and the Healing service began, I leaned over to Bob and told him, “If I hit the floor before Father Roy lays hands on me, I am not resting in the Spirit, I am having a stroke, so call an ambulance.” He asked me if I wanted to leave and I seriously considered that perhaps I should go to the hospital. I had been praying since March “not my will but Thy will be done”. That night in the church it was a mantra for me. I sang along with the music with my eyes closed and this mantra running through me all the while. As I sat there waiting to go up to the altar to be prayed over, I was nearly overcome by the smell of roses and the strong sense of a presence near me. Startled, I opened my eyes and looked around, but there was no one anywhere near me. I had been reading “Story of a Soul” by St. Therese of Lisieux and all throughout Lent and Eastertide, she was speaking directly to me through her writings. Now, as I was at my lowest point, completely surrendering my independence, admitting my weakness, and asking not for the return of my sight, but for the strength to be humbled, she was standing beside me. Finally, I went forward to the altar and no sooner did Father Roy lay hands on me, then I fell back and rested in the Lord’s Spirit. As Father Roy lay hands on the woman next to me, his robes brushed my leg and it was as though an electric shock ran through me. I heard a voice say to me “Your faith has healed you, my daughter.” I have no idea how long I lay there but when I got up, I was still in agony and my vision was just as awful. I talked with a few friends who promised to pray for me, found Bob and told him to take me home. As we rode home, I had my hands over my face to block out the oncoming headlights. Physically I was in agony but spiritually I felt so peaceful. We stopped for a bite to eat and then after reaching his house, I took the wheel and somehow managed to get myself home. I drove with my left hand covering my left eye and steering with my right hand. Exhausted, I went straight up to bed. The next morning, as soon as I opened my eyes, I realized I was no longer in pain. I also realized that my peripheral vision was back and the sunlight looked evenly bright in both eyes. I sat bolt upright and grabbed my glasses. Looking around and even out the window, I could see normally for the first time since December! I attend Saturday morning Mass every week and as I drove to the church that morning, I could see every blade of grass, every petal on the flowers, every leaf on the trees. Over and over, I kept repeating “Thank you, Lord! Thank you!” I am still repeating that to this day. By Sunday morning, I was confident enough to tell my mother that I could see again. I started telling everyone and anyone who would listen to me. I went to the neuro-opthalmologist as scheduled two weeks later and the visual field tests came back perfect in both eyes for the first time. Even in December, there had been a loss in the right eye, but with the left eye nearly blind; no one paid much attention to the right. In between the healing and the confirmation from the doctors, I made my Cursillo as planned. I was so very aware of how blessed I was and how loved I was by my God, which made for an incredibly powerful four days. While I was there, my sponsor had written to me that I needed to find a way to open up and share my gift of writing with as many people as I could. But how? After I came home, it suddenly hit me that a blog would be a great venue to start. This is by no means where I will stop. I have plans to complete a spiritual memoir, which I already had in the works. I am also putting together a program to teach children and adults the art of journaling, especially about their spiritual lives. The gifts that I needed: a new insight into myself, the courage to accept that new insight, and the boldness to share it publicly, all these were given to me that night. The Lord sent His messenger Therese to me months earlier and she showed me the way to be humble in His sight. I may never see my writings in print, but then neither did St. Therese. I am no saint, but maybe in my real and broken imperfection my words will touch someone else’s life. I find this passage, short as it is, loaded with imagery. Jesus comes to the home of Martha and Mary. Martha, thrilled that the Lord has chosen to spend time in her home, rushes about taking care of all the little details to make His visit a pleasant one. Mary, also thrilled that the Lord is in her home, places herself at His feet to listen to His every word as if He may not visit this place again. Her action seems simple enough in this modern age, but in the time of Jesus, she was bold, even brazen, to ignore her duties as hostess and sit with the men to listen to the Teacher. I am sure Martha was shocked at her sister’s complete lack of decorum. If you have sisters, you can put yourself into this story quite easily. Can you hear the conversation as Jesus is coming up the walk? Martha barking orders, checking the bread she has baking in the oven, making sure there is wine on the table, that there is water to wash off the dust from the road, and that the floor is swept perfectly. Mary, telling her sister to stop fussing, is standing at the door waiting for His arrival and rushes out to greet Him with a kiss. 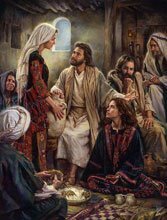 After a time, Martha complains to Jesus that Mary is not helping her with all the work. Jesus gently tells her that Mary has “chosen the better portion and it shall not be taken from her”. I wonder if Martha was hurt that He did not recognize that she was overworked or if she could see that He was calling to her to put aside her perfectionism for a time and just enjoy His company. Can you hear the discussion after He left? Did Martha throw up her hands in frustration and demand to know why Mary would not help her? Did Mary shake her head in dismay that her sister did not take the time to sit and listen to Jesus? Perhaps, they were able to spend time together talking about what each of them took away from the time spent with Jesus and were able to appreciate the perspective of the other and learn from each other. Martha chose to act in the service of the Lord by actively taking care of His needs and the needs of His disciples. Rested and refreshed, they were able to continue their journey and advance their mission of preaching that the Kingdom of God is at hand. Mary also chose to act in the service of the Lord by actively listening to His teachings. She stayed close to Him, listening attentively, remembering all the little details. Even though she did not always understand, she trusted that the day would come when understanding would be granted to her. Jesus is not going to come up the walk to my home and teach in my living room. But He does dwell within me. My very being is the home He has chosen to visit. I have to prepare a proper dwelling place for Him not by becoming perfect but by simply opening the door and being ready to receive Him with an open heart. I also have to recognize that it is time to stop fussing about doing everything right and to just sit with Him, listening to all He is trying to teach me. It is very easy to get caught up in religious practices, trying to create the perfect heart, and miss out on all the words of love He is trying to speak to me. It is also easy to become so caught up in reading and study that I can miss out on the opportunities to work with others on the same journey and so miss out on seeing that He is at work within them. I have much to learn from those He places around me and even though I rarely recognize it, they can learn from me as well. He did not come only to save us as individuals, but also as a community of believers interdependent on one another for strength, support, and the encouragement to persevere in the faith. We are to remind each other to be both the missionary of Martha and the contemplative of Mary, striving always to do His work by advancing His mission of proclaiming that the Kingdom of God is at hand. I wonder – where was the older brother all that time when the prodigal son was off partying? He was at home working the land. He was trying to live his life in a respectable manner, trying to do the right thing, and to just be an upstanding young man. He had tried very hard to be all that his father wanted him to be and yet when this kid brother showed up broke, starving, and stinking like pigs, he had to have felt cast aside as the welcome home party started without him. I have often seen myself in this story as the prodigal, crawling home to God in disgrace, miserable in my broken, sinful ways, begging forgiveness He had already granted, and seeking His grace, which was within me all along, but I was too blind to recognize. I am also disturbed to see myself in the judgmental older brother. I had prayed for some time now that my abusive soon-to-be-ex-husband would find God and change his ways. No sooner were the divorce papers and restraining order filed than he was in the chapel with the Blessed Sacrament pouring his heart out to Jesus. He has gone nearly every night since. And there is that nasty little gremlin voice inside me saying, “Oh sure now he goes?” I see him now attending daily Mass two evenings a week and he has not missed a Sunday Mass in sometime now. He has become more involved in the parish over the past year and yet prior to that, he had questioned every activity in which I became involved. The more I see this, the more outraged I become. Which leads me to the great question – WHY? Why is okay for me to be the prodigal but not Bob? I had to hit the lowest depths, the very edge of hell, to find my way back to God. Why should it be such tremendous leap of faith for me to accept that the same gracious and loving God who gathered me into His loving embrace would also reach out to gather up this broken man? Why is it so hard to accept that Jesus died on the cross as much for me as for Bob? I suddenly find myself filled with anger and outrage, demanding the vengeful justice of an authoritarian God. But if God were to deal with Bob according to the abuses he had inflicted on me, would He not also deal with me according to my own failings? Believe me, that would not be pretty as I have no great claims to sainthood. It is my faith that leads me to accept that the great banquet of God’s grace flows through each and every one of us. Yes, even through Bob. As I struggle to forgive the man who beat me down mentally, emotionally, and physically, I find myself nudged into ever deepening involvement within the faith community. There, I continually find the strength and grace I need to understand God’s unconditional love flowing freely through others just as lost and just as broken. I wonder if the older brother was able to finally enter the banquet and share the father’s joy over the return of the prodigal son. I wonder – did he stay away until all his anger and outrage was recognized and resolved or did he take the first step in faith, walking into the banquet uncertain if he could accept this scandalous brother? Did he take that step in faith knowing that his father loved him and wanted to share all the same wonderful gifts with him as well as his brother? Did he finally see that there had been times in his life when his father had forgiven him with the same loving embrace? I wonder finally if I can take that bold step in faith. Can I accept that God sees the beauty and goodness in Bob, just as He could see in me at my worst moments of sin? I don’t have that answer yet. But I have faith that God will grant me His grace to accept the anger and outrage and that He will heal the pain at the heart of these emotions. 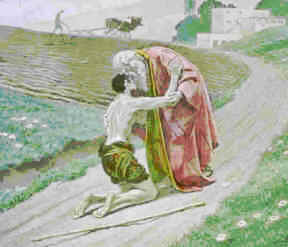 I know that He sees me as both the prodigal son and the older brother, because they are both a part of me. He loves and accepts me as I am, no matter where I am on this journey and He walks beside me, guiding me home, just as He does with Bob. So now the question is this: do I dare to knock? As I read this parable, the words that leaped off the page at me were not the familiar lines I have just quoted. No, what stood out to me was “in the middle of the night”. As I spent some time with this it occurred to me that when Jesus speaks of the man banging on his friend’s door to borrow three loaves of bread, he comes in the middle of the night. That led me to more questions than answers. How desperate do I have to be to bang on a person’s door in the middle of the night? How did I get to this door? Where did I come from? Did I leave a place of relative comfort and safety or I am searching for a safe haven for the night? If I bang on this door, do I really even know what I need? Do I have to courage to ask for it? Do I have the faith to admit that I may not know what I need but know deep down that I need something I can only find here? Do I have the audacity to ask for refuge for the night? One thing I am certain of: if I am going to venture out in the middle of the night in search of something, I would have to be fairly certain that the occupant of this house would open the door. I would also have to be certain that the occupant would be both capable and willing to provide me with whatever it is that I need. At the encouragement of my spiritual director, I placed myself in this scene and spent several evenings returning to it. The following is what I saw and heard there in the middle of the night at the door of the house of my Lord. For several nights, I could walk up the path to a small, warm looking cottage. 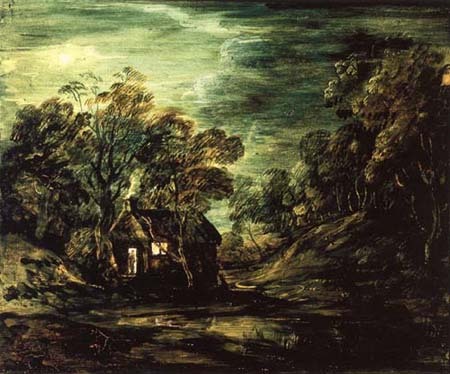 I could see a single light on in the kitchen and I could bang loudly on the heavy arched door of this cottage. Jesus would open the door and I would find myself frozen, without words, only tears. Part of me wanted to fall at His feet and part of me wanted to flee down the path, too afraid to admit I didn’t really know why I was there. I would stand there, crying, until I could stand it no longer and I would sadly take myself out of the scene, praying for the courage to return. After a week of this, I was finally able to stay there. The door opens and I am face to face with Jesus. I can see the kindness and compassion in His eyes. He already knows why I have come and yet He waits patiently for me to speak. I am overwhelmed by exhaustion and a swirling storm of emotions. I am tired, lonely, and completely empty. Again I am frozen, speechless, on the doorstep with tears coursing down my cheeks. Some nasty little voice inside whispers to me “Run! You don’t belong here and you know it.” I can feel the fear welling up inside of me. The insecurity creeps in again. Who am I to bang on the door of my Lord in the middle of the night? His gaze hold me fixed there on the doorstep and He smiles at me. There is so much love and tenderness in that smile and a gentleness in his eyes like I have never seen. I fight the urge to run. I so desperately need to be here. I want to be here. Why am I so afraid of such great love? The inner battle finally saps what little is left of my strength and I fall to ground at His feet, sobbing uncontrollably. I close my eyes, resting my head on my arms and fall fast asleep. I awoke the next morning in my bed after sleeping a full night’s sleep for one of the few times in several years without the help of alcohol or sleeping pills. I awoke refreshed and somehow lighter. All of the worries and fears are still with me, but they no longer have the same weight. All because I dared to knock. Why did the man in the parable knock on the door in the middle of the night? It was to borrow three loaves because a friend had come in from a journey and he had nothing to offer his friend. I have been filled and cared for so that I can return to my home and do the same for those who come to me in their hour of need. And when I am empty, I know the way to the house of my Lord. He will give me all that I need, including the courage to knock. Men aren’t the only ones who hate to admit they’re lost and don’t want to stop for directions or to consult the map in the glovebox. I often find myself praying for direction. I need the Lord’s help in navigating the twists and turns of my sometimes stormy life. The problem is when I pray for direction, I get it. Now don’t get me wrong, that is a very good thing. God doesn’t leave me standing on the roadside in the dark of night wondering where I’m supposed to be going. What gets me into trouble most often is that the paths that God asks me to take are not always the ones I want to take. Think Psalm 23 and the whole valley of the shadow of death idea. I’m good with green pastures, restful waters, my cup running over and dwelling in the house of the Lord forever. I can do without the valley and stopping for dinner with my enemies all around me. I’d rather sit comfortably in the house and have a nice relaxing dinner with the Lord, leaving the enemies outside in the valley of the shadow of death. I have a hard time accepting that while I am in control of my actions, I am not in control of the world around me. I would like to think I know exactly what God has planned out for the rest of my life. God certainly has planned the trip, but like the maddening dashboard GPS, He only calls out one navigational step at a time. 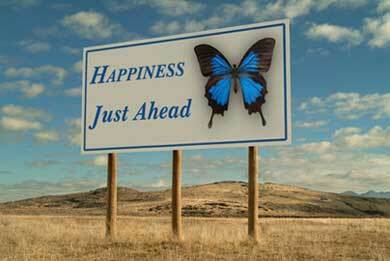 Then when I deviate from the plan, which is fairly often, He has to give me directions to get back on track again. In the end, the one moving forwards, backwards, or even going around in circles, is me. Free will is wonderful but it will absolutely get me lost when I start thinking I know a shortcut that is better than God’s path for me. I have found one thing to be true: whenever God calls out direction change, He has already given me everything I need to make the change. In other words, He prepares me before He sends me forth into something new. Now if I could just learn to trust in that, maybe I could spend less time going around circles trying to figure out the way forward. I keep asking for the map that God is holding which shows the whole path for my life but then there would be no mystery to life. How could I learn from my wrong turns if I never made them? How could I enjoy the surprises God has in store for me if I knew what was coming? Let’s face it, the surprises are all the fun in life. Besides, God knows me well enough to know if He gave me the map, I’d probably just lose it anyway.